Mobile telephony help us to talk on the move. The Internet turned raw data into helpful services that people found easy to use. On the road to 3G, this project report have an insight into the blossoming of 3G from 2G, the technologies involved, and their areas of application. 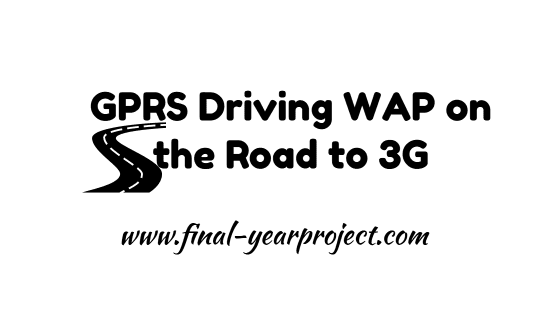 GRPS and WAP are definite stepping-stones on 3G wireless networks. Separately their improvements are useful upgrades and together they are a significant departure from 2G systems. You can also Subscribe to FINAL YEAR PROJECT'S by Email for more such projects and seminar. On the road to 3G, we shall have an insight into the blossoming of 3G from 2G, the technologies involved, & their areas of application. GRPS and WAP are definite stepping-stones on 3G wireless networks. Separately their improvements are useful upgrades and together they are a significant departure from 2G systems. A gradual transition and user acceptance for 3G could be a reality. Since the main goal of GPRS is to provide an intermediate step towards 3G, it needs to be both straight forward, so that it can deploy on existing systems and also provide a logical upgrade path to 3G. However it is very important to note that GPRS signaling and data transfer does not in fact travel through GSM networks. The GSM network is only contacted for table look up in Location Registers so that GPRS can find user profiles on the existing network.